The other night, I had leftover buffet on our weekly meal plan for dinner. The problem? No leftovers. 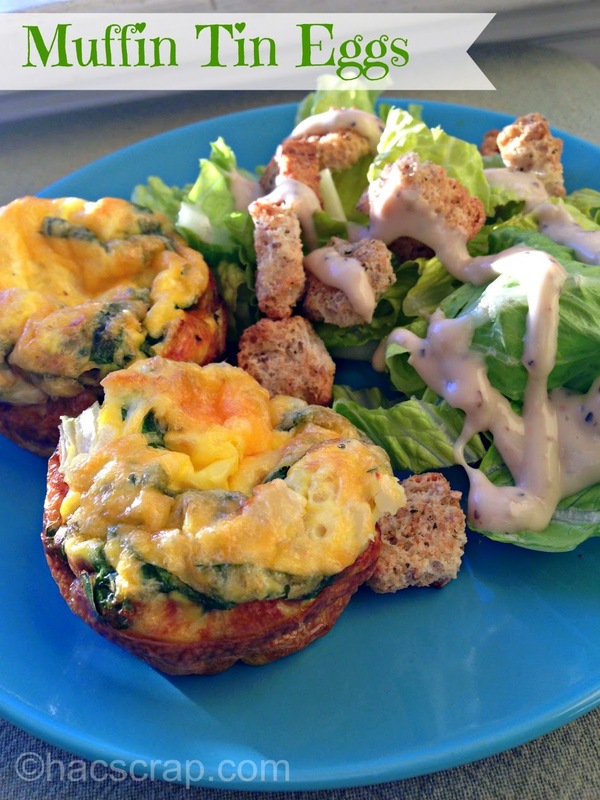 As I was sitting at my desk, debating what I had on-hand that was easy (this is precisely why I meal plan each week), an email popped into my inbox for mini frittatas. Now my kids were not going to eat the asparagus and mushroom variety featured in the recipe idea, but I could come up with my own. Vegetables, Meats and Cheese of your choice, diced. If you're using hard Vegetables, you may want to cook them first. I used Bacon, so I put that in the oven before I prepared my eggs. You can use ham, sausage, broccoli, tomatoes, spinach, onion, the choices are endless. 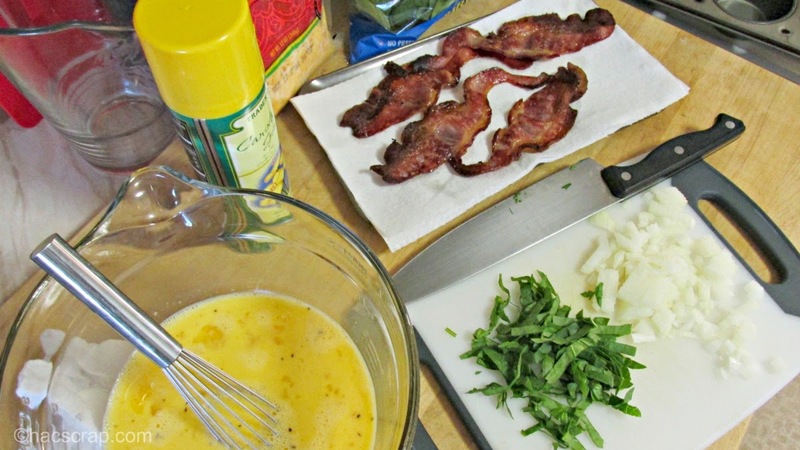 Whisk up your eggs and milk in a bowl. Spray your muffin tin with oil. 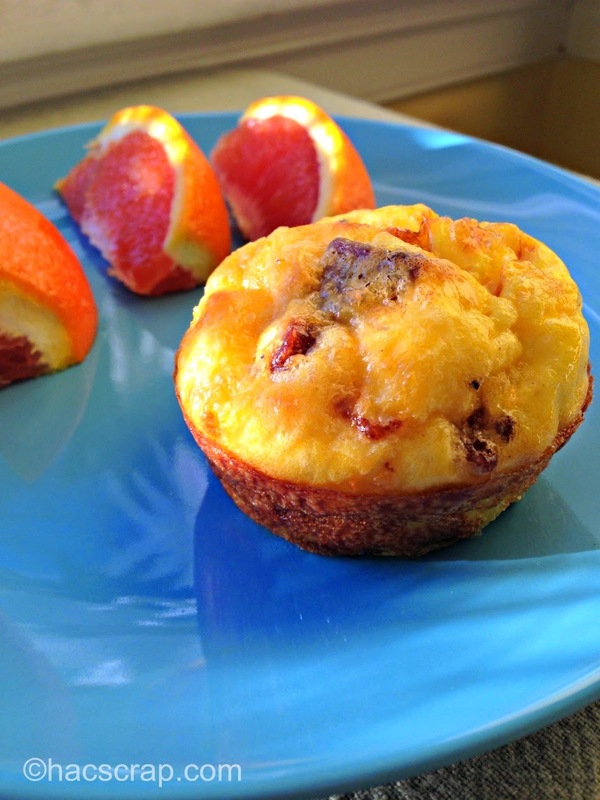 Divide your "filler" among the muffin cups. Fill each cup with the egg mixture about 2/3s of the way up. Sprinkle your favorite cheese on the top. Bake in the oven for about 20 minutes or until the eggs have set. They look beautiful and puffy when they come out of the oven. They will fall a little bit, but should pop right out of the tins. I made Spinach and Onion with Cheese, Bacon and Cheese and just Cheese for my first run with these. I served them with orange slices or salad on the side. An easy and quick dinner was born. Got some leftover? I put them in a ziploc bag in the refrigerator and re-heated them for a quick breakfast the nest day! These could easily be sliced in half to make a sandwich to-go as well.